01 Tom Bohli 1994 Switzerland BMC Development Team 4t 04' 16"
02 Antonino Parrinello 1988 Italy D'Amico - Bottecchia 03"
03 Andrea Pasqualon 1988 Italy Roth - Skoda 03"
04 Fabian Lienhard 1993 Switzerland EKZ Racing Team 03"
05 Clement Koretzky 1990 France Team Vorarlberg 05"
06 Francesco Reda 1982 Italy Team Idea 2010 ASD 08"
07 Victor De La Parte 1986 Spain Team Vorarlberg 14"
08 Nico Denz 1994 Germany Chambery CF 45"
09 Alberto Cecchin 1989 Italy Roth - Skoda 45"
10 Cristiano Monguzzi 1985 Italy Meridiana - Kamen Team 45"
11 Nicolas Baldo 1984 France Team Vorarlberg 45"
12 Redi Halilaj 1989 Albania Amore & Vita - Selle SMP 45"
13 Enea Cambianica 1989 Switzerland Meridiana - Kamen Team 45"
14 Paolo Ciavatta 1984 Italy D'Amico - Bottecchia 45"
15 Guillaume Martin 1993 France C.C. 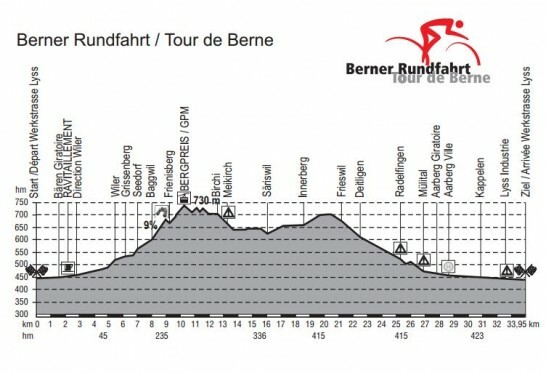 Etupes 51"
16 Valentin Baillifard 1993 Switzerland BMC Development Team 1' 04"
17 Marco D'Urbano 1991 Italy GM Cycling Team 1' 04"
18 Gian Friesecke 1994 Switzerland EKZ Racing Team 1' 16"
19 Thery Schir 1993 Switzerland BMC Development Team 1' 57"
20 Simon Pellaud 1992 Switzerland IAM Cycling 1' 57"
21 Giorgio Bocchiola 1989 Italy D'Amico - Bottecchia 1' 59"
22 Temesgen Teklehaimanot 1991 Eritrea Roth - Skoda 1' 59"
23 Davide Vigano 1984 Italy Team Idea 2010 ASD 2' 06"
24 Matteo Malucelli 1993 Italy Team Idea 2010 ASD 9' 22"
25 Silvio Giorni 1992 Italy D'Amico - Bottecchia 9' 22"
26 Mattia Viel 1995 Italy Chambery CF 9' 22"
27 Damien Touzé 1996 France C.C. Etupes 9' 22"
28 Sebastian Stamegna 1989 Italy GM Cycling Team 9' 22"
29 Hugo Hofstetter 1994 France C.C. Etupes 9' 22"
30 Johannes Weber 1994 Germany Team Stuttgart 9' 22"
31 Maarten De Jonge 1985 Netherlands Bike Aid 9' 22"
32 Lukas Jaun 1991 Switzerland Roth - Skoda 9' 22"
33 Mekseb Debesay 1991 Eritrea Bike Aid 9' 22"
34 Matteo Rotondi 1996 Italy GM Cycling Team 9' 22"
35 Jan-André Freuler 1992 Switzerland Team Hörmann 9' 22"
36 Jan Stöhr 1991 Czech Republic AC Sparta Praha 9' 22"
37 Nicolas Winter 1989 Switzerland Team Vorarlberg 9' 22"
38 Georg Loef 1994 Germany Team Stuttgart 9' 22"
39 Julien Roux 1995 France Chambery CF 9' 22"
40 Patrick Muller 1996 Switzerland BMC Development Team 9' 22"
41 Nikodemus Holler 1991 Germany Bike Aid 9' 22"
42 Nico Selenati 1996 Switzerland Switzerland 9' 22"
43 Niels Knipp 1994 Switzerland Switzerland 9' 22"
44 Leo Vincent 1995 France C.C. Etupes 9' 22"
45 Eugenio Bani 1991 Italy Amore & Vita - Selle SMP 9' 22"
46 Lukas Müller 1992 Switzerland EKZ Racing Team 9' 22"
47 Ueli Rhyner 1991 Switzerland Team Hörmann 9' 22"
48 Benjamin Jasserand 1994 France Chambery CF 9' 22"
49 Emanuel Kiserlovski 1984 Croatia Meridiana - Kamen Team 9' 22"
50 Alexandre Mercier 1990 Switzerland Team Humard Velo-Passion 9' 22"
51 Remy Rochas 1996 France Chambery CF 9' 22"
52 Andrea Ruscetta 1990 Italy GM Cycling Team 9' 22"
53 Eduardo Estrada 1995 Colombia D'Amico - Bottecchia 9' 22"
54 Jose Tito Hernandez 1994 Colombia GM Cycling Team 9' 22"
55 Christoph Springer 1985 Germany Team Vorarlberg 9' 22"
56 Maxime Froidevaux 1994 Switzerland Charvieu-Chavagneux IC 9' 22"
57 Uros Repse 1993 Slovenia Meridiana - Kamen Team 9' 22"
58 Killian Frankiny 1994 Switzerland BMC Development Team 9' 22"
59 Pierre Idjouadiene 1996 France C.C. Etupes 9' 22"
60 Volodymyr Kogut 1984 Ukraine Amore & Vita - Selle SMP 9' 22"
61 Adriano Brogi 1991 Italy D'Amico - Bottecchia 9' 27"
62 Thomas Terretaz 1995 Switzerland Team Humard Velo-Passion 9' 27"
63 Florian Nowak 1995 Germany Team Stuttgart 9' 27"
64 Pavel Stöhr 1991 Czech Republic AC Sparta Praha 9' 27"
65 Nico Brüngger 1988 Switzerland Roth - Skoda 9' 27"
66 Lucas Spengler 1994 Switzerland BMC Development Team 9' 27"
67 Jaap De Jong 1995 Netherlands Chambery CF 9' 27"
68 Alexey Vermeulen 1994 USA BMC Development Team 9' 27"
69 Volodymyr Fredyuk 1992 Ukraine Amore & Vita - Selle SMP 9' 27"
70 Matteo Badilatti 1992 Switzerland V.C.Mendrisio-PL Valli 9' 27"
71 Taylor Eisenhart 1994 USA BMC Development Team 9' 27"
72 Simon Brühlmann 1995 Switzerland EKZ Racing Team 9' 27"
73 Marc Garby 1991 Denmark Team Idea 2010 ASD 9' 27"
74 Alessandro Pettiti 1990 Italy Team Idea 2010 ASD 9' 27"
75 Max Walsleben 1990 Germany Team Stuttgart 9' 27"
76 Andrea Cacciotti 1996 Italy GM Cycling Team 9' 32"
77 Julian Schulze 1995 Germany Team Stuttgart 9' 32"
78 Thomas Capocchi 1993 Italy D'Amico - Bottecchia 9' 32"
79 Marcel Aregger 1990 Switzerland IAM Cycling 9' 32"
80 Marco Zamparella 1987 Italy Amore & Vita - Selle SMP 9' 32"
81 Olivier Beer 1990 Switzerland V.C.Mendrisio-PL Valli 9' 32"
82 Luca Cappelli 1993 Italy Team Idea 2010 ASD 9' 39"
83 Andrea Vaccher 1988 Italy Roth - Skoda 9' 39"
84 Cyrille Thiery 1990 Switzerland V.C.Mendrisio-PL Valli 9' 54"